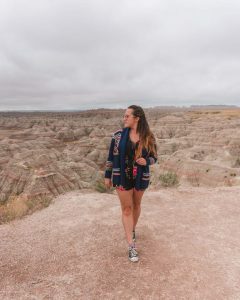 The Badlands is definitely one of the most underrated national parks in the USA and is a must visit when in South Dakota! 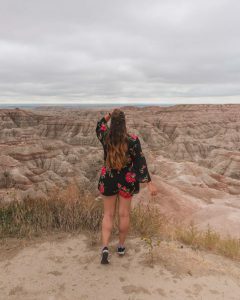 The main thing I struggled with when planning our trip to South Dakota was the best route through Badlands National Park and the best viewpoints to stop at. I was really surprised by the lack of information pertaining to where to stop along the Badlands loop road for the best views of the park. So, of course, I made a guide about it once we got back! Our trip to South Dakota and the Badlands was part of a larger road trip covering Colorado, Wyoming, Idaho, Utah, Montana and Nebraska so our start and end points for our route through Badlands National Park were affected by our onward journey to Mount Rushmore and down into Nebraska. 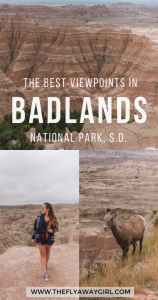 So, if you’re planning a South Dakota road trip and are looking for the best route through Badlands National Park then keep on reading! Disclosure: I collaborated on a sponsorship basis with Hertz UK on this road trip. All opinions are, as always, my own. How long does it take to drive the Badlands Loop Road? 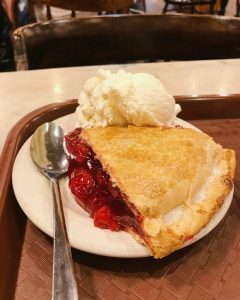 Before we get into the nitty-gritty of which roads to drive and what stops to make, let’s start with a bit about how we planned our road trip. 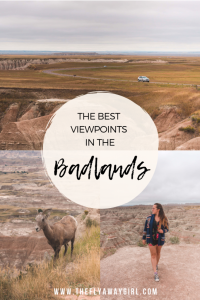 Our original road trip idea had simply been Colorado and Wyoming, but my dad was pretty set on doing Badlands National Park and – since he was driving – I didn’t have much choice in the matter. 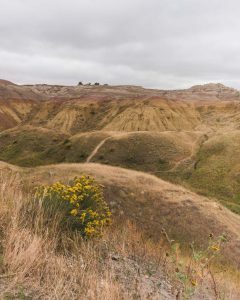 Feel free to skip sections and head down to ‘best route through Badlands National Park’ from the contents section above! For planning a road trip, I love to use Roadtrippers. 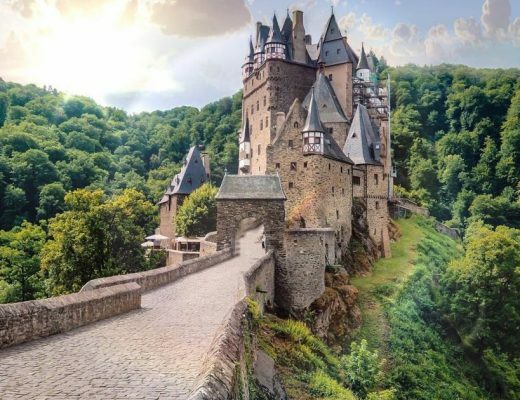 I generally used the app rather than the website (since usually I was doing it from the car) and I’ve also found it’s much better in the US and Canada rather than other countries (although it still did pretty well on planning out a Germany road trip too). The app is totally free to use and the main thing I love about it is the ability to add a whole bunch of places and the app sorts them for you into the best route. There was a bit of confusion as it wanted me to do the road trip the other direction (since my start and end points were both Denver), but that was easily fixed. It made it simple to add new destinations and see how much of a detour it would take and also where it would fit best in our route. I’ve used Hertz in multiple countries and I’ve always found them reliable, good value for money and to have a good choice of cars. When we picked up our car in Denver, we looked at three different cars as we weren’t sure if they’d have enough boot (“trunk” for the Americans here) space for our suitcases. If you’re planning a road trip to the Badlands and aren’t coming from as far away as we were (i.e. from Denver by way of Utah, Wyoming, Idaho and Montana…) then your best options for collecting a car would be Rapid City or Rapid City Regional Airport. Other pick-up points in the state are Sioux Falls (south) and Aberdeen (north), depending on where you’re travelling from. Book and complete your USA road trip by the 16th December for 20% off your booking! Okay, I promise we are almost at the main part of my guide to the best route through the Badlands. 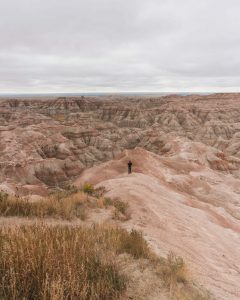 But before you visit Badlands National Park there are a few details you should know first. 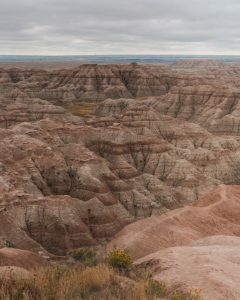 Badlands National Park is over 240,000 acres of protected area and the southern half is jointly managed by the National Park Service with the Oglala Lakota tribe. 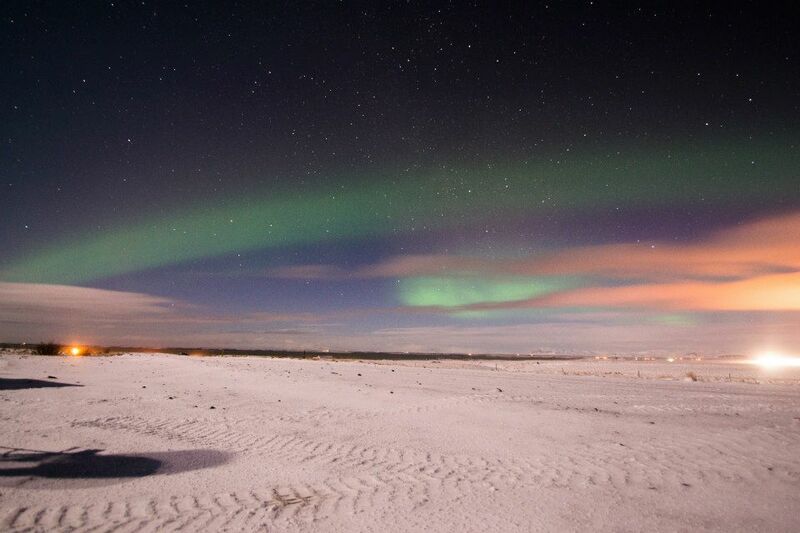 It became a National Monument in 1929 and was redesignated a National Park in 1978. The Lakota people (not the first Native American tribe to inhabit the area but they were the majority by two centuries ago) referred to the place as ‘mako sica‘ or ‘land bad’ due to the extreme temperatures, rugged terrain and lack of water. French-Canadian fur-trappers who came to the area called it ‘les mauvais terres pour traverse‘ or ‘bad lands to travel through’. 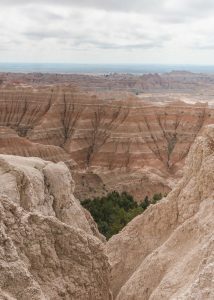 Homesteaders arrived in the Badlands at the end of the 19th century after the construction of the Milwaukee Railroad that passed the area. The US government stripped the Native Americans of much of their territory and the Oglala were forced to flee south to Wounded Knee where the Wounded Knee Massacre of 1890 occurred. 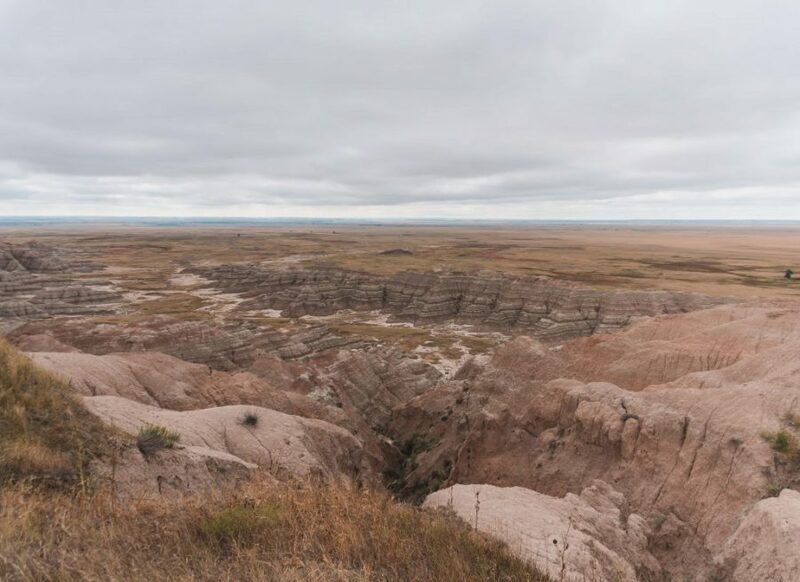 The Lakota found large fossilised bones and fossilised seashells in the soil of the Badlands formations and surmised that the area had once been underwater. I’m no geologist myself, so I’m going to aim to give a simplified version of the formation of the Badlands. 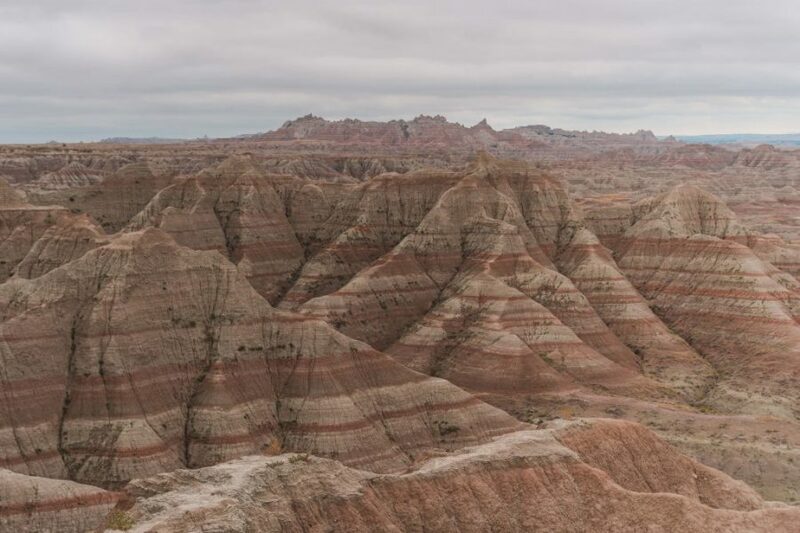 The Badlands are, in essence, layers of different types of rock. The very bottom of the formations (Pierre Shale) was black ocean mud from when sea stretched across the Great Plains – fossil clams and sea reptiles confirm the environment. 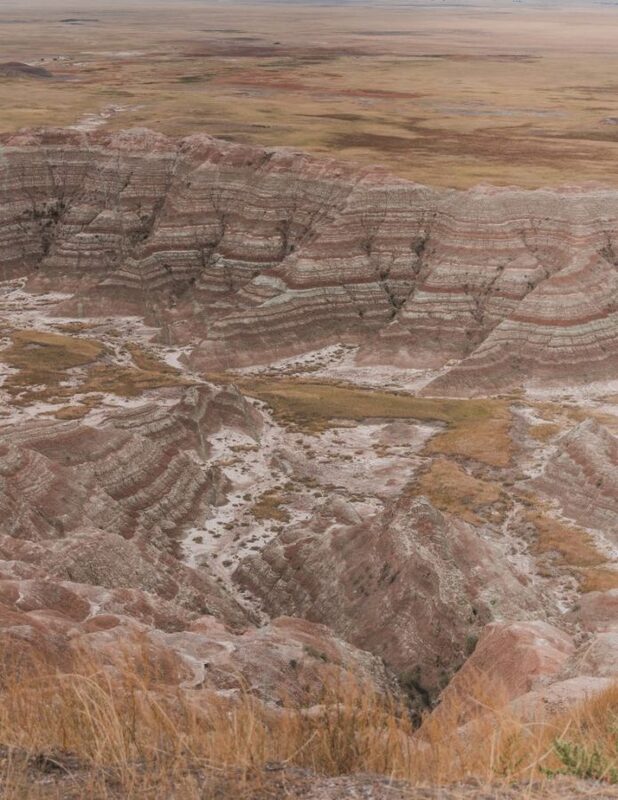 The lowest layer – the grey ‘Chadron Formation’ – was deposited between 34-37 million years ago by rivers across a floodplain – when the rivers flooded the plain, more sediment was deposited. Alligator fossils have been found in this later. The next layer up is called the ‘Brule Formation’ and is a tan/brown colour and was deposited between 30 and 34 million years ago. Bands of sandstone interspersed among the layers mark the course of rivers that flowed from the Black Hills. The next layer – the Rockyford Ash – was deposited 30 million years ago, forming the bottom layer of the Sharps Formation. Finally, the light Sharps Formation was deposited from 28 to 30 million years ago by wind and water – volcanic eruptions supplied ash during this time. 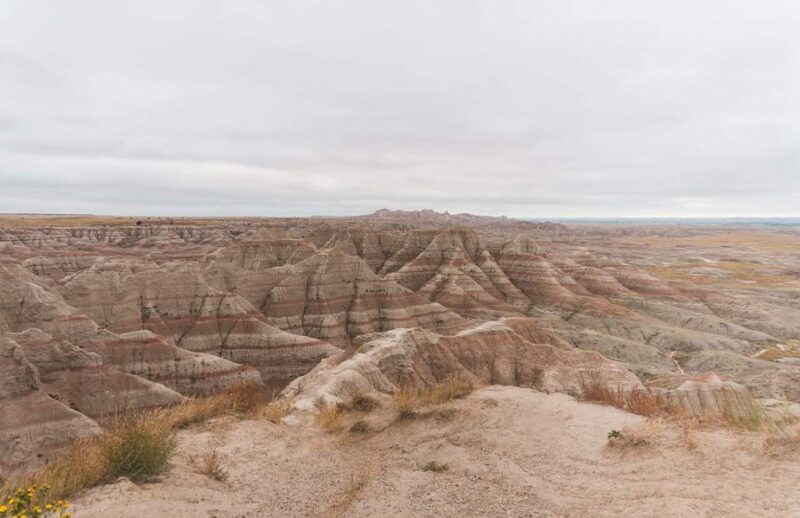 The Badlands used to be under the ocean – when the sea drained, the ocean floor was exposed to the air. The shapes we see today are caused by 500,000 years of erosion by rivers and wind. The rock formations continue to erode at a rate of one inch each year so the landscape is ever changing and geologists believe that they will completely erode in the next 500,000 years. Crazy! Learn more about the formations on the National Park Service website. Driving the Badlands Loop Road takes about an hour with no stops, but our trip with all the stops took us about 2.5h overall to drive the loop road from the start (Interior entrance) to the end (Wall). The drive from Rapid City to the start of the loop road will take you around 1h20 minutes and the drive back from Wall to Rapid City will take around 50 minutes. We continued on from Wall to Mount Rushmore which takes approximately 1h 20 minutes to drive. After driving the Beartooth Highway that winds up and down a mountain from Wyoming to Montana, we drove from Red Lodge via Sheridan to Rapid City, South Dakota. 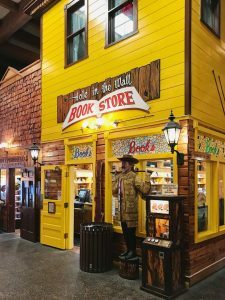 Rapid City is a perfect place to start your Badlands road trip from as there are lots of things to do in the city, which is the second most populous in South Dakota. Nicknamed ‘Gateway to the Black Hills’ and ‘City of Presidents’ after the nearby mountain range and the famous Mount Rushmore. We stayed at the comfortable Foothills Inn during our stay, which is a nice and cheap inn in Rapid City. Located just off the I-90, it’s a perfect place to stay if you’re driving in and out of the city. This is a no-frills hotel, but the rooms were clean and comfortable, parking was free and breakfast included delicious sausage, egg and bacon biscuits. Book a room at The Foothills Inn from only $39 per night for a double room. 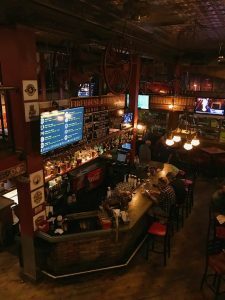 I didn’t know what to expect when we arrived in Rapid City but we quickly discovered that they have a great craft beer scene! 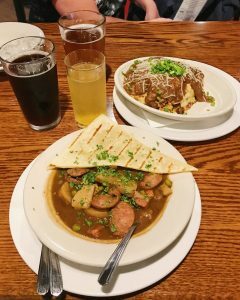 For dinner, head to Firehouse Brewing Company for delicious food and drinks – I recommend the Rancher’s Pie and the Stout and Hearty, so good! 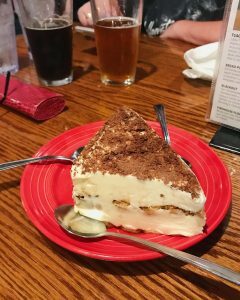 Don’t forget to finish off your meal with a slice of the tasty tiramisu. They also have great beers and ciders from their own microbrewery. Beer guru The Flyaway Dad (yup, my dad) tried ‘Semper Fi’ (an American Amber) and ‘Mail Order Bride’ (a black IPA) and reports that they were very pleasant. For more drinks head to Hay Camp Brewing, another microbrewery in Rapid City. 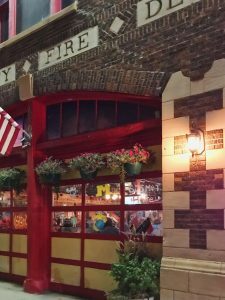 It’s a pleasant walk from Firehouse Brewing past many of the ‘City of Presidents’ sculptures. 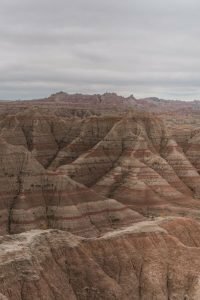 We drove from Rapid City along SD Highway 44 past Scenic and Interior, turning left after Interior and driving up the 377 and entering the park through the Badlands Interior Entrance. This is a beautiful scenic drive to enter the park and is much more pleasant than simply driving the I-90 to get into the park. 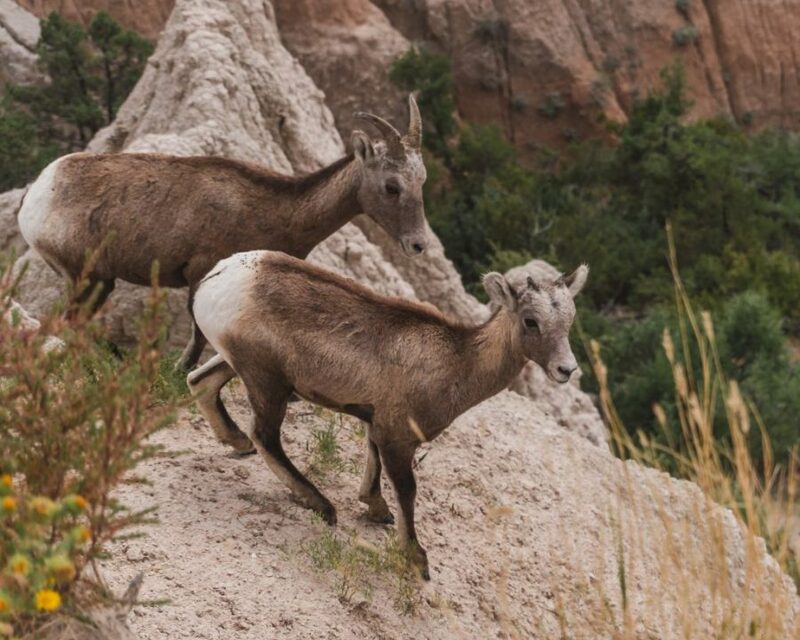 Plus it’s the best route through Badlands National Park to begin at the Ben Reifel Visitor Center. In my opinion, the best route through the Badlands starts at the Badlands Interior Entrance. The park costs $20 to enter (and this ticket lasts for 7 days), but for us, it was more cost effective to have purchased the Interagency Annual Pass ($80) as it includes over 2,000 recreational areas including the Badlands, Yellowstone National Park, Grand Teton National Park and Colorado National Monument (all of which we visited on our road trip). The other bonus of the annual pass is that at some parks (such as Yellowstone) there is an ‘express queue’ for those with passes and you get to skip the long queues. Start your visit to Badlands National Park with a stop at Ben Reifel Visitor Center. The visitors’ centre has an exhibition on how the park was created (which I definitely recommend checking out) and there’s also a gift shop with guidebooks and more. We picked up a small guide to the park which was great at pointing out some of the good viewpoints to visit, as well as pointing out the variety of wildlife to be found there. The other great bonus of the visitors’ centre – the restrooms. Since you will want to spend at minimum a few hours in the park it’s a good spot to *ahem* ‘prepare’ yourself for the journey. After the Ben Reifel Visitor Center, drive 9 minutes on the 240 (full name: Badlands Loop State Scenic Byway, SD 240 and usually known more simply as the Badlands loop road) up to Big Badlands Overlook. This overlook is your first grand view over the eroded land of barren buttes and sharpened pinnacles. This overlook has an accessible walkway and – as with the rest of the national park – just be wary of rattlesnakes. It is fairly rare for people to get bitten by the snakes there but it is still possible so aim to stay on the trails and keep your eyes peeled just in case! 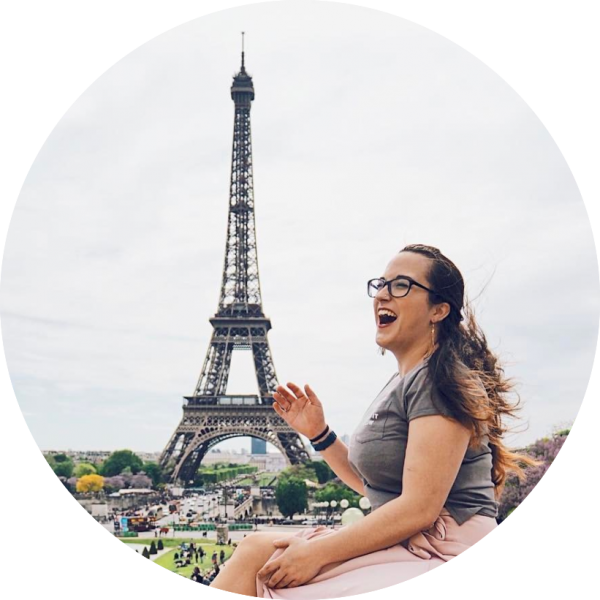 The thing about being a blogger – sometimes you have to do things wrong in order to tell people how to do them right… yup. I’m basically here to screw things up for your future benefit. We continued north from the Big Badlands Overlook in order to drive along the I-90 and then back down along Big Foot Pass Road. I will tell you now – don’t do that! Big Foot Pass Road is less of a ‘road’ and more ‘dirt track’. 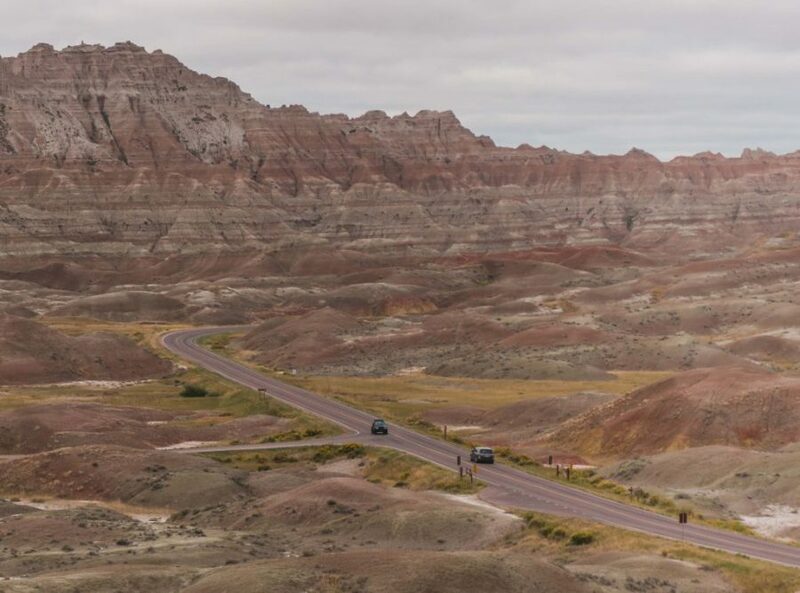 I would definitely recommend driving back the way you came from Big Badlands Overlook and taking a right turn before getting back to the visitors’ centre. This takes you along the main loop road (that we rejoined after coming down Big Foot Pass Road) that runs the entire way through the park from Cactus Flat to Wall. Route wise, it does make more sense to come into the park from the Cactus Flat entrance but it means you miss the scenic drive along Highway 44 which is a great way of coming into the park! The two overlooks (that I found out about after, otherwise we wouldn’t have done our little detour along Big Foot Pass Road) which we missed are Saddle Pass Trailhead and Bigfoot Pass Overlook. Saddle Pass Trailhead is, as the name suggests, the start of a trail – it’s one of the shorter trails in the national park but the rugged terrain can be hazardous after rain so just be cautious. The views at the start of the trailhead are supposed to be beautiful as well, if you’re not feeling like a hike. Another spectacular viewpoint is Bigfoot Pass Overlook, which looks over one of the major passes. The Bigfoot Pass is an ancient trail that was used to cross the Badlands from the northern prairie to the southern ones. 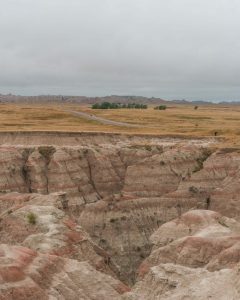 The biggest importance of the overlook is its significance in Native American history – in December 1980 Chief Big Foot (actual name Spotted Elk, Big Foot was, in fact, a derogatory name given to him by a US Army soldier), chief of the Miniconjou (Lakota Sioux), led his people across the Badlands through the pass while attempting to evade the US Cavalry. They were fleeing to Wounded Knee in the south but were intercepted by the 7th Cavalry battalion. The chief was ill with pneumonia and surrendered peacefully – the cavalry forced the tribe to make camp near Wounded Knee Creek. The next morning, soldiers entered the camp and demanded that the Lakota give up their weapons. At one point during this confrontation, a firearm was discharged and the ensuing massacre by the soldiers resulted in 153 Lakota being killed. The majority who were killed were women and children, and the Lakota chief was also killed. Panorama Point is located just west of the Bigfoot Pass and provides a beautiful view across the Badlands that seems to go on forever! Some people consider it one of the best photography points in the national park and definitely one of the best sunset spots in the Badlands! This overlook provides a wonderful view over the rim area as well as the south section of the prairie, and the Buffalo Gap National Grassland to the south. 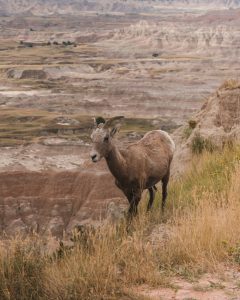 Named after Wilson Burns who established a sheep operation in the basin below the overlook at the start of the 1900s, this overlook offers a panoramic view over the basin. The view from the Homestead Overlook in the Badlands is across the plains to the farmlands below the overlook. Homesteaders came to the Badlands when the Milwaukee Railroad was completed from Chamberlain to Rapid City through Kadoka and Interior in 1907. Most of the settlers tended to live in tents or shacks and the majority of the homesteads were later abandoned or sold. 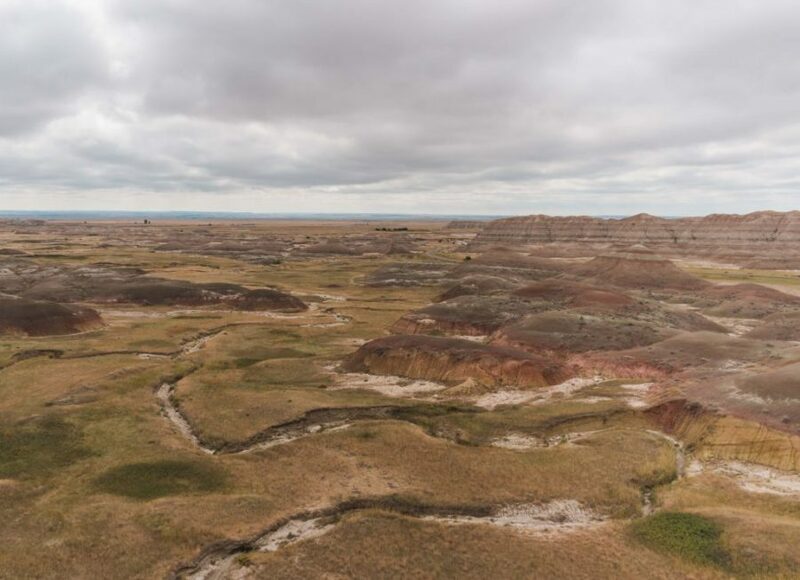 While homestead law at the time set the maximum area at 160 acres, the arid nature of the topography of the Badlands meant that laws were changed in the area to increase land allowances there to 640 acres. Homestead Overlook provides an impressive view of the ‘delicately banded colours’ that cover the rock formations as well as the farmlands of the homesteaders below. Yellow Mounds Overlook was quite possibly my favourite overlook in the entire national park – this viewpoint offers spectacular views of the bright yellow mounds (shocking where the name came from really) which formed when the sea drained away and the exposed ocean mud reacted with the air to create a yellow coloured soil. These mounds are an example of a fossil soil or ‘paleosol‘. Pinnacles Overlook was our final stop on the Badlands loop road – there is another pleasant overlook before this (Ancient Hunters Overlook) but since we wanted to make it to Mount Rushmore the same day we decided to skip that one and go to Pinnacles only since it was recommended as one of the best. 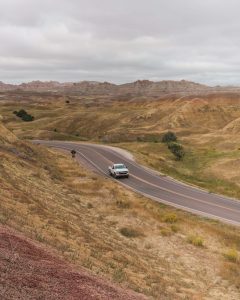 The best route through Badlands National Park ends just after Pinnacles Overlook – you then exit the park to the north in the direction of Wall. Many people refer to Pinnacles as the ‘best view in the Badlands’ and I can see why. 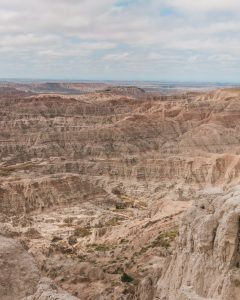 It offers a spectacular view over the ridges, shelves and tabletops of the eroded layers of sediment that makes up the Badlands. It’s also a great spot to view wildlife in the park! We saw lots of pronghorn, which is a really unique North American mammal. It’s the only surviving member of the family Antilocapridae and, although people often think it’s a deer or antelope, it is its own species. Their closest living relatives are in fact giraffes and okapi, but they are also distantly related to the deer species. We saw a whole herd of pronghorn down on the prairie and a few even came up onto the viewing points! The pronghorn are easy to identify due to their distinctive white markings on their body. 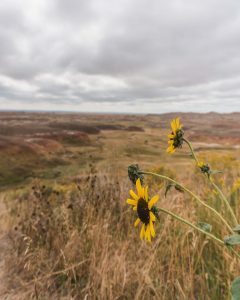 The Sage Creek Rim Road is supposed to be even more spectacular than the Badlands Loop Road – however, it’s a dirt road and only recommended if you have a car suited to offroading. 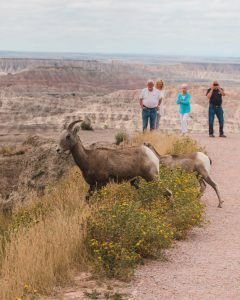 The viewpoints are fewer but the drive offers more in the way of wildlife, including prairie dogs, buffalo, bison and pronghorns. 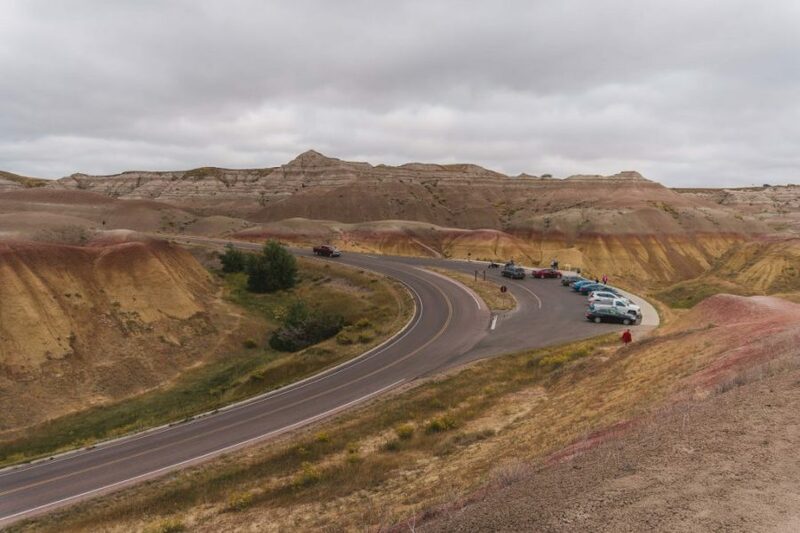 The final part of the best route through Badlands National Park is the section of the loop road up to Wall. 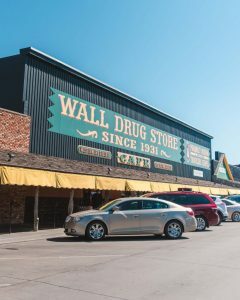 While the drive itself isn’t particularly special (particularly after you’ve seen all the incredible viewpoints along the way) you should definitely make a stop at the town of Wall, plus we saw a whole load of tiny prairie dogs on the drive! Wall is a small town of fewer than 1,000 inhabitants and was named for the nearby Badlands Wall, the 100-mile stretch of tiered cliffs that make up the Badlands. 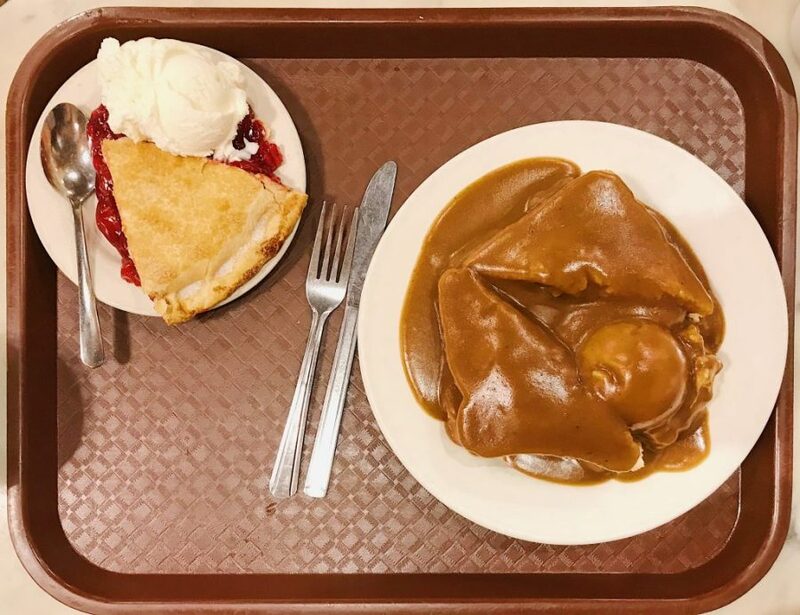 It’s most well-known for Wall Drug Store, which started originally as a small pharmacy in 1931 but is now a huge attraction – definitely stop by to go to the restaurant for a delicious hot beef sandwich smothered in gravy and finish off with a slice of cherry pie and a mug of their 50 cent coffee. After Wall, we drove onwards down to Mount Rushmore which is a perfect way to end your road trip through the Badlands. 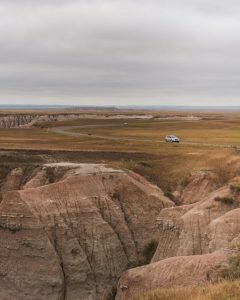 I hope this helped you plan your trip to the Badlands – in my opinion, this is definitely the best route to take through Badlands National Park! 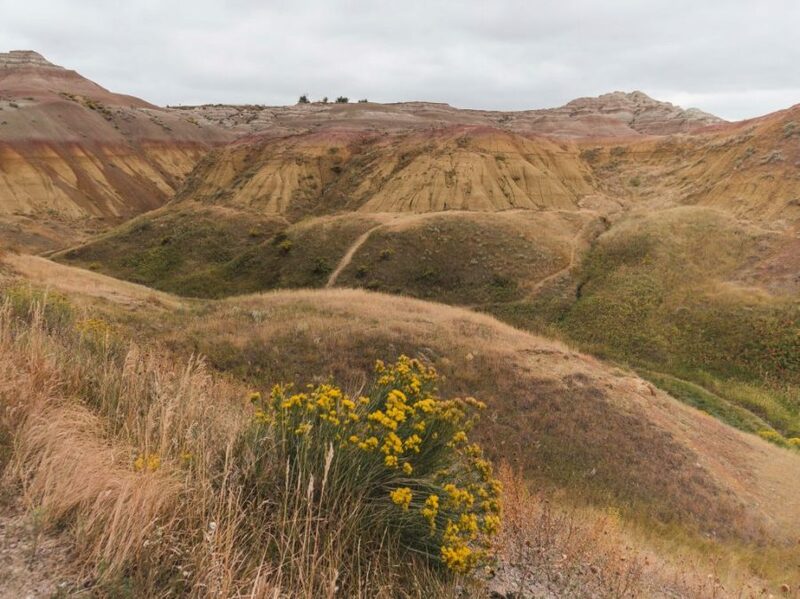 Have you visited the Badlands? Let me know in the comments!